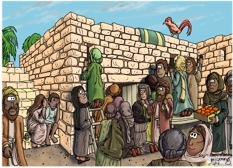 1 Several days later Jesus returned to Capernaum, and the news of his arrival spread quickly through the town. 2 Soon the house where he was staying was so packed with visitors that there wasn’t room for one more person, not even outside the door. And he preached the word to them. I have set the scene mid morning. Sunlight comes from the right. Various Hebrew people. Many of them are looking in through the door of the house where Jesus is teaching. 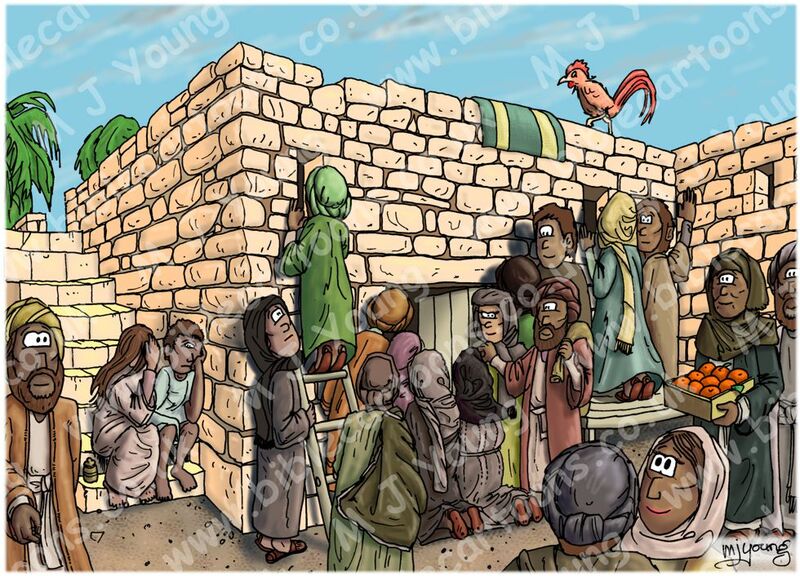 The scene is entirely made up from my imagination, although I did some research on biblical archeology, in order to find out about building materials & house construction methods, in order to accurately depict the house throughout this story sequence. I’ve used my usual selection of muted colours for the clothing of people in the crowd. I think ordinary people in biblical times probably had linen (flax) clothing, coloured using readily available natural dyes (from crushed minerals, animals & vegetable matter) giving fairly simple, muted colours.